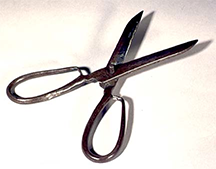 Revolutionary War scissors. Photo courtesy Guilford Courthouse National Military Park of the U.S. National Park Service. When we hear about across-the-board reductions in resources or staff, we know two things right away. First, it isn't good news. Second, the cuts probably won't be "across-the-board." Experience tells us that very often those with clout who object to the cuts will receive smaller cuts or perhaps even increases. The terminology of uniformity is at odds with experience. And suppose you're one of the (usually) few who are fired or laid off. For you, the cut is 100%, not 5% or 8%. If you're one of these, your experience of "across-the-board" is rather different from the experience of almost everyone else. Still, despite the high price we pay for the contrast between language and action, we continue to use metaphors of uniformity as we execute the uneven reductions. Why? And what can we do instead? We do want to be fair. We believe that "spreading the pain" proportionately is most likely to be fair. Numerical fairness is an illusion. Because reducing waste in larger, more mature organizations is easier than in smaller, younger ones, identical proportional cuts in projects or departments both large and small, both mature and youthful, are inherently unfair. Instead of devising mathematical algorithms, choose to monitor waste — even in good times. Understand that the larger, more mature business units are better able to resist waste monitoring and reduction efforts. To truly achieve fair reductions, make reductions that are progressive with the scale and maturity of the business unit. take time.usually have to make reductions quickly, we rarely have time to tailor a reduction profile that conforms accurately to the needs and objectives of the organization. Simple proportionality is an enticing expedient. Thoughtful decisions take time. Not having time to make a thoughtful decision is a poor excuse for making a less-than-thoughtful decision, and it's an indicator of inadequate resources at the level of the decision-maker. Apply whatever resources you need to make smarter decisions. If you have to, spend a little to avoid misspending even more. The message that "we're all affected equally" calms the population. Exploiting their sense of fairness, we help people justify their own inaction and powerlessness, and we make it easier to manage the horde. Manipulation does work in the short term, but its effects expire quickly, leaving a residue of simmering, unresolved, and disempowering resentment. We pay for it all eventually, in distrust, cynicism, low morale and depressed performance. Encourage people to voice objections and then deal with them. Recognize that even though stifling objections might make the ride smoother today, it makes the ride rougher tomorrow. Would you like to see your comments posted here? rbrenBgVGJEtQXVhveoWXner@ChacyUlAPmPNMtfPqtIVoCanyon.comSend me your comments by email, or by Web form. I offer email and telephone coaching at both corporate and individual rates. Contact Rick for details at rbrenvsADyPPgYyfaZJpzner@ChachQzZPxdEedFlKRLaoCanyon.com or (650) 787-6475, or toll-free in the continental US at (866) 378-5470.